Ryan Hall Will Finish Top Ten in London! We believe it is important to run fast on the track while preparing for a fast marathon - Greg MacMillan MY COMMENT: Good interview with Greg McMillan- unlike Ritzenhein, not afraid or revealing his runners "secrets." His comment agrees with what I've been saying all along about Ryan Hall's lack of racing at shorter distances. It remains to be seen if Hall can pop another good marathon without showing any improvement in his track times. I posted this in Feb, 2010- and after 2 horrible races leading up to London, I believe Ryan Hall is finally beginning to figure it out. In this interview with letsrun.com, Hall says "What I've learned recently is the importance of speedwork for me. I've been doing a lot more interval work than I've done for recent marathons. I've realized how important speed is for me. I have had to change my training to prioritize my training to emphasize that." I've been saying this for a few years now about Hall's approach to marathon training, yet he has continued to hammer out one decent marathon after another. But if he's looking for something new to boost his fitness besides more rest, he's probably found it. Let's hope it's not too little too late for Ryan. From the sound of this, he may be ready for a top 10 finish. I enjoyed this inteview with Pat Tyson, who reflects on what life was like as Steve Prefontaine's roommate. I got to meet Pat at a track meet in Eugene in 2009, who started talking to me like some long lost buddy- even though we'd never met, I think he sensed running as a common bond. Pat is currently head track and cross country coach at Gonzaga. Intensity of Exercise Increases Body Temperature- Not Dehydration! You shouldn’t relate overheating to dehydration. You overheat when you run too fast. That’s the key. You don’t overheat because you become dehydrated. The brain’s too clever. If you’re not going to drink, the brain will slow you down, and that will lower your body temperature, not raise it. So, we’ve got some great studies where we look at people running half marathons, marathons, short ultramarathons, and long ultramarathons. The longer the race, the lower the temperature, because they are running slower - Tim Noakes in Outside Online. Waterlogged! Everything You Think You Know About Dehydration But Don't! "If fluid loss leads to thirst, why do some of the best competitors finish endurance races in quite advanced states of fluid loss? Time and again, studies, even those by researchers expecting different outcomes, have shown that the runners who are the most dehydrated, as measured by percentage of body weight loss, run the fastest. " 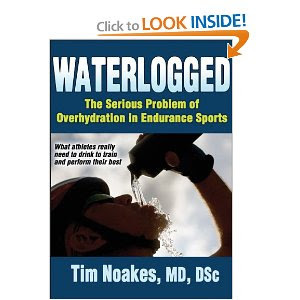 - Waterlogged excerpt in Running Times MY COMMENT: Tim Noakes is generally recognized as the leading authority on dehydration and endurance performance. I can't wait to read this new book!